When using a Canon IXUS it's easy to fall into the mind-frame that it's a top of the range model – because of the well known branding. The IXUS 132 is a sub £100 model, so it can't be treated in the same way. There are going to be some failings and there are. For example, we think that noise would be showing at ISO 100 if it wasn't for a top notch noise reduction system. Looking at the pictures at normal viewing size, noise is only really visible at ISO 800 and only annoying at ISO 1600, which proves just how good it is. Colours are recorded realistically enough but that can make them bland in some cases. Dynamic range is nonexistant and the screen doesn't do pictures any justice at all. We also noticed that the screen moves slightly from side to side by a few millimetres. This may be a design flaw in our test model, but try it out before purchasing anyway. Including the histogram in playback is quite good stuff for a sub £100 camera. Saying that, the Canon IXUS 132 does have a bit going for it for the price that it's been given. The build quality, while not the best, is good enough for general use. It feels like a plastic covering. The zoom is relatively long at 8x optical and it has a wide-angle field of view. The tripod bush is made of metal and that's usually reserved for more expensive cameras, so it's nice to see it on a budget model. On the downside, the HD video isn't FullHD, it's 720p. The buttons on the back aren't the most responsive, or easiest to use, and the zoom lens can be heard during video playback. The Canon IXUS 132 would ideally suit a first time photographer looking for a smart little model with a good brand name and some decent features. It fits easily into the pocket, looks good on a night out and will keep younger users amused with the digital effects. Kids will like creating a toy town style photo with the Miniature effect and also using the selective colour to enhance pictures. 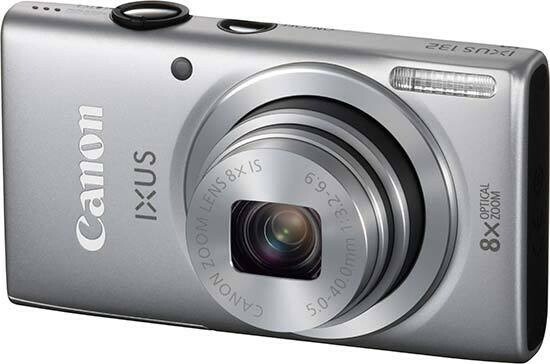 If you're a young family, looking for a budget point and shooter, then the Canon IXUS 132 could be right up your street.